Most people in Washington attribute the success of Politico’s marquee morning newsletter, Playbook, to the superhuman work ethic of its main author and Politico’s Chief White House correspondent, Mike Allen. 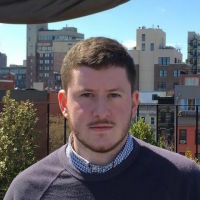 According to several 2010 emails recently obtained by Gawker, however, Allen has employed one unusual productivity trick: letting someone he covers ghostwrite an item for him. Gawker has received the latest round of emails between reporters and Philippe Reines, the longtime Hillary Clinton confidante, former State Department spokesperson, and frequent pen pal of Mike Allen. This month’s batch contains yet another friendly email exchange between Reines and Allen whose contents belie Allen’s claim as an adversarial journalist. We have previously reported that Allen once promised to only ask pre-approved questions in an interview with Chelsea Clinton and assured staff members of a senior Democratic lawmaker on Capitol Hill that he would conduct a “no-surprises” interview with their boss. The following email exchange demonstrates the same tendency. In it, Allen permits Reines, then serving under Clinton at State, to actually ghost-write a Politico Playbook item about the State Department. Premiering tonight at 9pm on the National Geographic Channel (both regular and HD! ): “Inside the State Department” For over a year the Secretary of State’s soft-media savvy team gave the documentarians unprecedented access to every corner of the Department, including to HRC herself both here in Washington, DC and abroad. The movie, a serious behind-the-scenes look at the work of State’s 60,000 workforce globally, was screened to rave reviews last month before a standing room only crowd at NGC’s headquarters on 17th Street, and feature many faces familiar to Playbookers. * WARNING: allowing your Cabinet-level boss to watch may be detrimental to your professional health and result in the ultimate annoying question: Why can’t I get something like this done about ME?! If you do get that question, blame Caroline & Philippe. VIEWER ALERT - Premiering tonight at 9 on the National Geographic Channel (regular and HD! 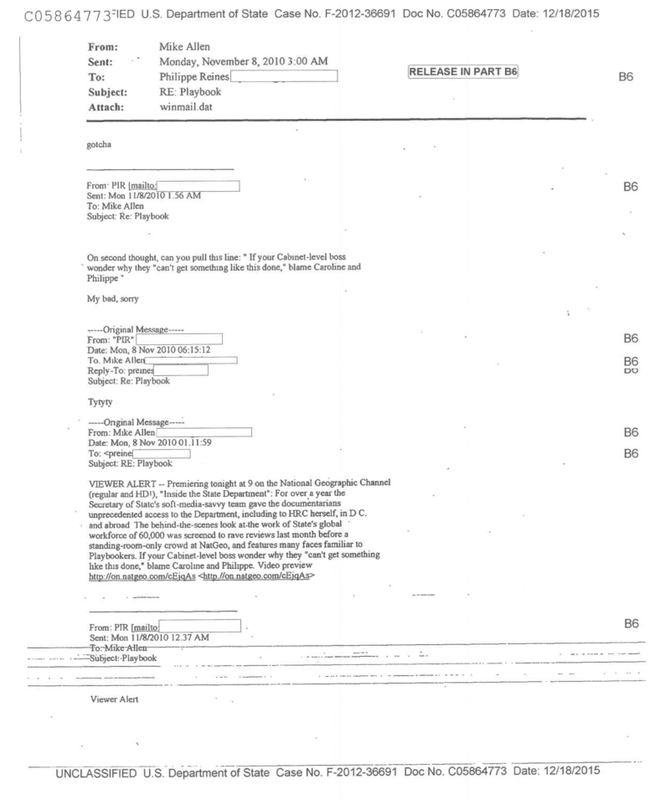 ), “Inside the State Department”: For over a year the Secretary of State’s soft-media-savvy team gave the documentarians unprecedented access to the Department, including to HRC herself, in D.C. and abroad. The behind-the-scenes look at the work of State’s global workforce of 60,000 was screened to rave reviews last month before a standing-room-only crowd at NatGeo, and features many faces familiar to Playbookers. If your Cabinet-level boss wonder why they “can’t get something like this done,” blame Caroline and Philippe. VIEWER ALERT — Premiering tonight at 9 on the National Geographic Channel (regular and HD! ), “Inside the State Department”: For over a year the Secretary of State’s soft-media-savvy team gave the documentarians unprecedented access to the Department, including to HRC herself, in D.C. and abroad. The behind-the-scenes look at the work of State’s global workforce of 60,000 was screened to rave reviews last month before a standing-room-only crowd at NatGeo, and features many faces familiar to Playbookers. Playbook has previously come under scrutiny for its often-murky division between sponsored items and editorial content, as spelled out in a series of posts by Erik Wemple of The Washington Post. But the exchange reproduced above suggests a much larger problem with the newsletter’s daily output: That otherwise normal-looking, non-sponsored Playbook items can be fashioned, and even directly written, by the people those items are about. Even more troublingly, Allen appears to be actively complicit in obscuring their original authorship. Then again, it’s possible that Allen considers this process to be part of his service to his elite Washington readers. After Wemple’s series came out in 2013, Allen told Michael Calderone of The Huffington Post, “I have based my career on honesty and trust ... I write Playbook 365 days a year because I enjoy it, and greatly respect the readership it has attracted. 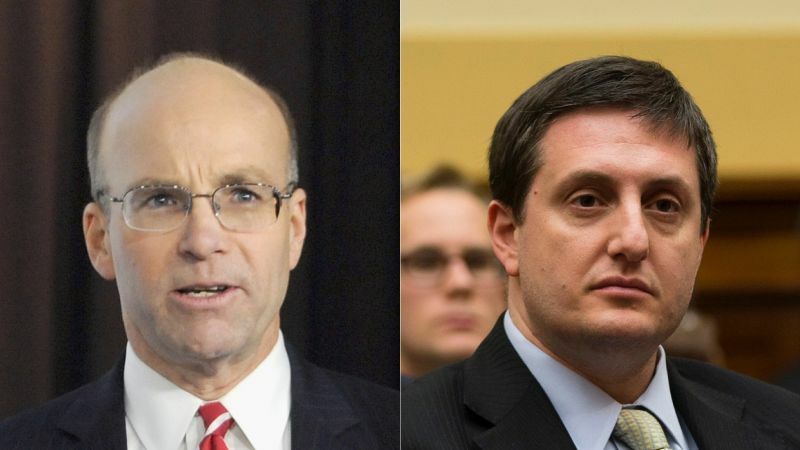 I make my decisions based on a single consideration: whether the item would serve the audience.” Indeed, it would be hard to argue that Reines, or any other member of the D.C. establishment, isn’t served by Mike Allen’s Playbook. This National Geographic television special was worth flagging for Playbook readers and as such the information was condensed into our signature, bite-sized format with a link to the outside source. We’ll have more from the latest round of emails next week.